Awww! Dog News Featured Pet Supplies Travel Video Wow! 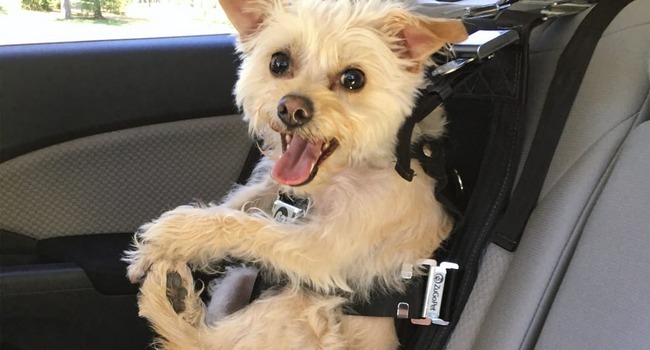 ZuGoPet’s Rocketeer Pack is a pet car seat that doubles as a backpack and is designed for small dogs. The Rocketeer is designed for dogs (or cats!) that weigh 25 pounds or less and doubles as a backpack. ZuGoPet’s Rocketeer Pack is a pet car seat that doubles as a backpack. Designed for small dogs (and even cats!) 25 pounds or lighter, the Rocketeer received a five-star rating from the Center for Pet Safety. It may look like a harness, but it acts like a car seat, as the pet’s bottom is elevated off the backseat of the vehicle. At press time you could order one at ZuoGoPet for $158. Check out the video below! Pit Bull With Dwarfism Has The Best Dad Ever!